Joe Corbi’s is one of the leading Pizza Kit fundraising companies in the country. The company was founded in Columbia, MD in 1983. Joe Corbi got his start in the pizza business in 1958, at the age of 14. He worked for his father at the Baltimore Pizza Crust Company, which produced and distributed pizza crusts to food outlets throughout the state of Maryland until in 1981 he left the company to Start Joe Corbi’s. 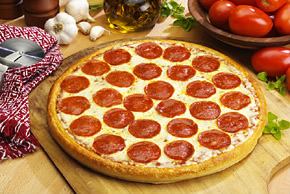 Hundreds of hours of research went into perfecting the unique pizza recipes that define the Joe Corbi’s difference and then in 1983 Joe Corbi’s Wholesale Pizza, Inc. was founded. Joe Corbi started the business by simply manufacturing pizza crust and selling them to local markets, pubs, VFW’s and out of our storefront. Our original building was roughly 2,400 square feet of bakery, processing, office and storefront. That concept then evolved into a pizza kit in a box that contained 3-12″ pizza crust, one can of pizza sauce and one bag of 18oz cheese. Then right around 1988 one of Joe Corbi’s customers approached him about selling the product as a fundraiser..the rest is history. Our Service! In a survey conducted by an independent marketing firm our customers rated our service highest on the list of reasons why they do business with Joe Corbi’s. This is backed up with a 100% product guarantee with each customer who purchases a Joe Corbi’s product. Our Product! Three decades of gourmet pizza brings you the best pizza making kit ever. Each Classic pizza comes with our legendary Corbi family sauce, made with California tomatoes and Italian spices. In addition to our crust we use the highest quality 100% Real Cheese Blend w/ mozzarella, provolone and cheddar cheese. Our Reputation! Ask anyone who has ever run a Joe Corbi’s Fundraiser or who have consumed our products. We have an impeccable reputation in the fundraising industry and beyond. Our customers and consumers will relay a positive customer service and product experience.